New Rochelle, NY, October 19, 2016–Researchers delivered human stem cells seeded in biological sutures to the damaged heart muscles of rats following induced acute myocardial infarction and assessed the effects on cardiac function one week later. The differences in mechanical function at a local and global level when stem cell seeded sutures were used compared to sutures without stem cells are reported in an article in BioResearch Open Access, a peer-reviewed open access journal from Mary Ann Liebert, Inc., publishers. The article is available free on the BioResearch Open Access website. The study entitled "Functional Effects of Delivering Human Mesenchymal Stem Cell Seeded Biological Sutures to an Infarcted Heart" is coauthored by Katrina Hansen, Glenn Gaudette and colleagues from Worcester Polytechnic Institute (Worcester, MA), Massachusetts General Hospital (Boston, MA), and University of Arkansas for Medical Sciences (Little Rock, AR). The researchers demonstrate changes in heart function that occur directly in the region where they delivered the stem cells. These regional functional changes were not evident with the use of non-cell seeded sutures. The authors describe how varying the concentration of stem cells used to seed the sutures and the timing of seeding affected that amount of cells seeded onto the sutures. "This study addresses an important issue in cell therapeutics: how to deliver the cells to a specific target," says BioResearch Open Access Editor Jane Taylor, PhD, Edinburgh Medical School: Biomedical Sciences, University of Edinburgh, Scotland. "Although cardiac repair was the goal here, this work has potential applications for a whole range of other cell types and tissues." Research reported in this publication was supported by the National Institutes of Health under Award Number RO1-HL115282. The content is solely the responsibility of the authors and does not necessarily represent the official views of the National Institutes of Health. BioResearch Open Access is a peer-reviewed open access journal led by Editor-in-Chief Robert Lanza, MD, Head of Astellas Global Regenerative Medicine and Chief Scientific Officer, Astellas Institute for Regenerative Medicine (Marlborough, MA), and Editor Jane Taylor, PhD, MRC Centre for Regenerative Medicine, University of Edinburgh. The Journal provides a new rapid-publication forum for a broad range of scientific topics including molecular and cellular biology, tissue engineering and biomaterials, bioengineering, regenerative medicine, stem cells, gene therapy, systems biology, genetics, biochemistry, virology, microbiology, and neuroscience. All articles are published within 4 weeks of acceptance and are fully open access and posted on PubMed Central. 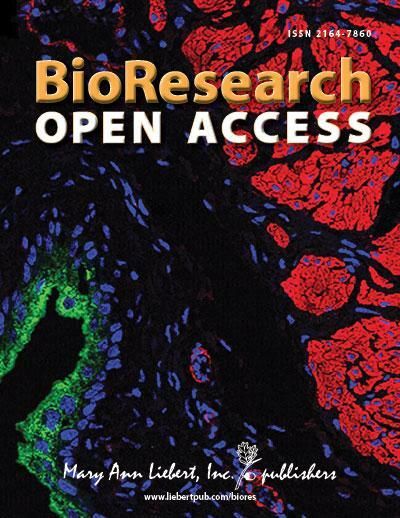 All journal content is available on the BioResearch Open Access website. Mary Ann Liebert, Inc., publishers is a privately held, fully integrated media company known for establishing authoritative peer-reviewed journals in many areas of science and biomedical research, including DNA and Cell Biology, Tissue Engineering, Stem Cells and Development, Human Gene Therapy, HGT Methods, and HGT Clinical Development, and AIDS Research and Human Retroviruses. Its biotechnology trade magazine, GEN (Genetic Engineering & Biotechnology News), was the first in its field and is today the industry's most widely read publication worldwide. A complete list of the firm's 80 journals, books, and newsmagazines is available on the Mary Ann Liebert, Inc., publishers website.